My 15-year old niece took her first flight out of the country last night. She’s due to arrive in Melbourne right about now, but so far, I haven’t received any text messages or calls from either her or my sister. And joy of joys, I’ve also run out of pre-paid credit on my mobile, so I can’t call them. Naturally, I Googled for flight tracking websites. The biggest downside with these flight tracking websites is that most of them are limited to flights coming in and out of North America. I did find one that covers Asia and Australia: Flightstats.com. I liked the website because aside from its nice interface, once you register, you can receive alerts on flights you are tracking. Unfortunately, I’ve refreshed the page a million times and it hasn’t updated the flight status, nor have I received any alert. Worse still, Philippine Airline’s website only track flights that depart and arrive in Manila. Bleah. Maybe I should just sneak into my sister’s (my niece’s mother) room and check her cellphone, no? [EDIT] Silly me, I forgot to check Tullamarine’s website. Doh! 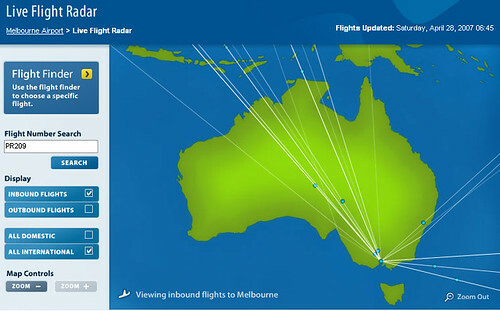 Aside from checking every inbound and outbound international and domestic flights to and from Melbourne, the website also have a Live Flight Radar that lets you see all the flights originating and leaving Tulla.